Hi everyone. Sorry for taking so long to update this week. I was just waiting to show you this. All the smiles for Laura. Now, do not take this at face value, kids. I am not suggesting for a single moment that one should just shamelessly lift things from accomplished novelists, because that is plagiarism. However, I would like to make a suggestion if you’re looking to improve your narrative voice and expand upon your own themes and techniques. Write an original story imitating the works of an author you admire. Properly. As in, all your own words and imagining you are another author coming up with a story they might tell. Not just mad-libbing one of the author’s pieces. You’d be amazing the weirdness that can transpire from this. You get to think about how you write and how to control your own narrative voice through trying to get a handle on someone else’s. Anything from flash fiction to a short story to a poem is good for this exercise. Just get thinking about what kinds of characters they use and what messages they have; the atmosphere, voice and dialogue. Sometimes it produces different results, too – like revealing other influences on your writing. For example, I recently wrote a story attempting to imitate Edgar Allan Poe’s style of horror. Then, as I wrote it, it took on a completely new meaning and interpretation because I realised I was mixing some Murakami in there too. So even when you try to control what you write, it’s amazing who else comes to the party. Give it a shot. It’s challenging, but illuminating. As you can probably guess, SCAMPER is particularly geared towards inventing new products and Ze Business World. However, I’d like to volunteer it as a process for creative writers, too. If you’ve picked up a book about writing lately, you will have no doubt learned that there are only so many story premises in the world and only so many basic plots. It can feel like a major soul-sucker when you first discover this principle. You will suddenly feel, in the words of Tyler Durden, that your story is not a beautiful or unique snowflake because somebody has done something similar themselves in a different genre or setting. 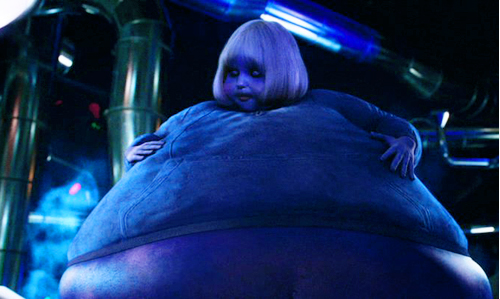 Combine: How could one combine Charlie and the Chocolate Factory with The Hunger Games? Would this be a preferable outcome for Foxface? Adapt: Under what circumstances could the cast of The Only Way Is Essex become a crime-fighting squad of MENSA members who did charity work on weekends? Magnify: What if Lisbeth Salander from The Girl with the Dragon Tattoo were trained as a ninja and had a lot of clones? Put to other use: What if Will’s knife in His Dark Materials cut through tough steak rather than the fabric between parallel worlds? Eliminate: What if Bella Swan and Edward Cullen were not in Twilight? Wouldn’t it be wonderful? Rearrange: What if Harry Potter’s parents had been killed by Voldemort during his time at Hogwarts in a cake-related disagreement, rather than before? Who knows, maybe this tack of “modifying the pre-existing” could ironically produce something far more original? A more detailed description of SCAMPER, as well as a list of related questions you can be asking yourself, can be found here. Be sure to check out the question randomiser, too. Now, SCAMPER away, my pretties! Before this week, I had struggled with the idea of writing prompts. I always wanted to challenge myself and so went for several random words at once, but none of the random word engines I came across seemed particularly good or reliable. When bunches of fairly easily connectable random words came up I began to wonder how astute the random word generators actually were. I began to contemplate how many words were actually in these generators; whether all the supposedly random words in each group were truly independent of one another, or if they appeared in a finite number of fixed groups which just seemed to be random. After all, I didn’t want to be the thousandth person out there writing a story about a squirrel eating metal sandwiches whilst trying to somersault on a motorcycle in front of swans fighting furry ladies. But I feel a little differently now. Partly I’ve just joined a writing course, which I think is helping me to look at everything as an opportunity to write. I haven’t heard anyone’s work yet, but already a competitive streak is starting to emerge in me. Though admittedly my competitive streak is not renowned for being entrenched in sound logic. For example, I am irrationally competitive with Frank Sinatra because we share a birthday. But that’s a story for another day. Another helpful factor has been stumbling across a particular word prompt website which is totally fantastic. It’s called The Write Prompts and has a variety of different challenges to try, supplying a new one every day to get you writing frequently. I’ve already made use of several of them myself. So in conclusion, my advice is to open your mind, push yourself and look for more unusual stimuli to stay motivated. And by ‘motivating stimuli’ I do not mean arranging to being poked in the back every hour with an electric cattle prod. I never thought I’d become the kind of person who wrote by hand. I’ve always been so paranoid about losing sheets of work, I hold my pen awkwardly enough to bring about discomfort after short periods and, okay, fine, I am a bit of an IT snob. Plus, growing up, writing on a computer made me feel important and intellectual. I was writing documents, after all. Documents! But then Broadband happened. And YouTube. And Facebook. And Wikipedia. And online gaming. And suddenly writing on a computer became a very different game. A game I have recently cut back on tremendously. Charlie Haynes, runner of Urban Writers Retreat (yes, the apostrophe is meant to be missing – she says so herself! ), offers a useful piece of advice. She notes that writers beat themselves up about being so easily distracted, and yet continue trying to write around huge temptations in modern life. What they need to do is work in an environment where they are removed from those distractions. So that’s what I did: got out these old mysterious relic items called a ‘pen’ (from the Latin, peniferus inkius) and ‘paper’ (formerly an Old English acronym) and began to write. And I’m writing a lot more than I’ve written in an awfully long time! There’s also an anti-perfectionist edge to writing things out properly. The Delete and Backspace buttons can’t tempt me into dismissing anything I don’t particularly like. On paper, if it’s written, it’s written and you have to make the effort to work with it. Plus you can focus exclusively on your project rather than constantly splitting your attention in several directions. So, thank you, Charlie. And thank you, archaic writing tools. And thank you, internet, for not calling me back to you too relentlessly. On another note, however, a quick celebration of another set of milestones! I have now written over 20 posts and have over 30 blog followers, over 50 blog likes, and over 125 Twitter followers! Thanks so much to every one of you for your support! It means so much that you would associate yourself with a nutcase like me! I think most of us have a kind of ocean mentality to organisation. We swallow up all this stuff indiscriminate of how much we actually need or want it. In time, the tide turns, all those things wash up onto the beach for us to inspect and we realise we need to tidy up. Well, sometimes. Other times it takes a stern word from PETA armed with pictures of pelicans covered in oil and a crab munching on plastic packaging. Either way, though, eventually the job gets done and we feel better for it. So why is it so damn difficult to feel that way about computer files? Seriously. I just reorganised my hard copy portfolio into a nice folder. I’ve split it into five sections with dividers, plastic walleted all draft material by their corresponding story, alphabetised it all and can find everything I’m after in seconds, and I’m not even that great at organising myself. But with computers I just can’t do it. I think organisation has a tactile dimension to it that computer programmers just haven’t learned to imitate yet. Documents are, after all, just pixels. There’s no handwriting or scuffs or scribbles on computer files; no real memory of writing the page that isn’t superseded by every other page I’ve ever written on Word in the past. It isn’t a physical object and so, on some level, my brain just can’t fully grasp its significance. When I look at a bunch of desktop folders, with their white backgrounds and appropriate but bland file names, I don’t see pages of my stuff. I just see a bunch of icons that don’t really mean anything to me. I still feel removed from my work. There are ways to make the sight more bearable and the contents more aesthetically pleasing and manageable. OneNote essentially makes your work look like a binder with links in and tables; tags can shorten file paths and keep things organised into sections. Windows’ own icons can help distinguish one thing from another more clearly. But perhaps no matter what a programmer does it won’t help much. Perhaps, I realised tonight, you have to find or make value for your files’ appearance yourself in order to establish this elusive connection. Perhaps you have to put a little of your own psyche into those dull icons and get the cogs turning whenever you see them – to use something warm and familiar and entertaining that has personal meaning to you. Something which took an internet quest to find, and brings joy whenever you see it. And that’s how I ended up downloading Wall-E as my Recycle Bin icon. Is Writer’s Block Just Martyrdom? I am sure some people have approached this post with a flicker of outrage and defensiveness that anyone could even deign to suggest such a thing. But How To Write Damn Good Fiction by James N. Frey dares to barrel into this most sensitive of subjects for most writers. Frey writes an appropriately “Damn Good” guide to writing fiction, and one from which I have taken much over the years. It goes over the finer points of plot development and writing techniques with a refreshing level of conviction, and does so assuming that the aspiring author already has the chops to write to a respectable level in the first instance. It’s also witty and the author’s voice is, in my opinion, unusually distinctive and powerful. When I first read this, I myself was rather wounded at the accusation. I could think of many a time where I had legitimately felt completely uninspired to write and hated every word I had forced onto the page; times where the back-space button was used almost as much as every letter on the keyboard combined. Nonetheless, since writing was a private pursuit, I never shared my feelings of frustration with anyone. Under those circumstances, how could he possibly suggest that such a decision had anything to do with seeking sympathy? When I completed his novel, however, I did begin to understand a little more where he was coming from. In fact, his book was the inspiration for a previous post: to write professionally, one must treat writing as a profession. You have to work at it every day and meet targets, just as you would any other job. If you have an off-day at work, you may not be spectacularly productive, but you will achieve something nonetheless. In fact, even on good days at work, most of us are not ecstatically happy to be doing our jobs. We accept that it is a living and either don’t use our jobs to define ourselves or justify them as a stepping stone to something bigger. Likewise, as Frey asserts, one must not bellyache over one’s drafts for fear of imperfection if they truly ever want to produce. This was always a problem for me. I am notoriously indecisive and a perfectionist. I continually worried that my penmanship wouldn’t match the image in my head, and simultaneously feared the images in my head were not clear enough for me to write about. A complete Catch-22. Ultimately, however, I overcame this to realise the most important thing was to produce something. Otherwise there would be no novel at all. I do not agree with Frey that writer’s block is a product of subconscious martyrdom, but do see that I have used it as an excuse to avoid writing, instead declaring my novel-creating time better spent on world construction and research periods, downtime and plot re-evaluation. It has been employed as an excuse. When it isn’t, it is, in my opinion, not an obstruction to one’s ability to write, but an obstruction to one’s own belief that one can write. To an extent, I also believe the word, “Inspired,” sets the bar very high as a consistent writing experience. Some people begin their writing lives unfulfilled because they are convinced they should only write on an inspiration rush, rather than barrelling through when they aren’t. Personally, I think the characterisations of writer’s block as a tangible thing, as an enemy or an affliction, contributes to a state of learned helplessness amongst writers – as does identifying inspiration as an antidote or dynamo. Moreover, since I have refused to even think these terms whilst writing, I have found it increasingly easy to soldier on and be productive. Perhaps if instead we could think in terms of easier days and harder days – remove “writer’s block” from our vocabulary altogether – we would all be a little less discouraged. So, I turn the question on you, the lovely reader. What is your opinion on writer’s block?